PinkyPiggu: Gunther's Modern French Cuisine @ Purvis Street ~ An Awesome Dining Experience! 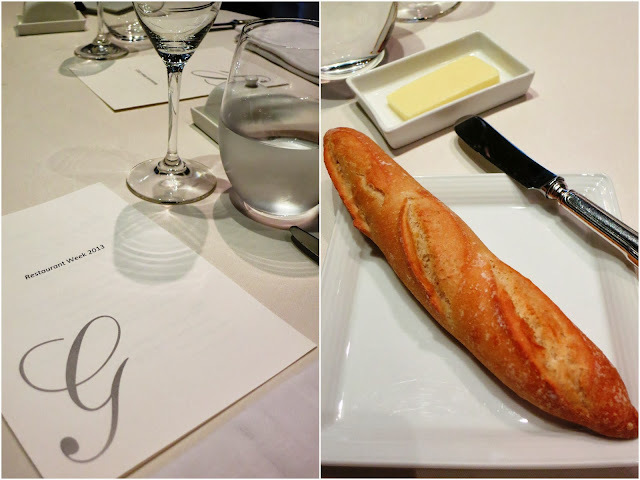 Gunther's Modern French Cuisine @ Purvis Street ~ An Awesome Dining Experience! I must admit, this is a very much overdue post which I had overlooked to write earlier and might have forgotten about if I had not done a run-through of all the drafts sitting on the blog. My excuse: Too much food to eat, not enough time to write (oops please don't judge me :p). I believe this situation is quite common among some other food bloggers too lol. Anyway, this was a visit to Gunther's Modern French Cuisine, a swanky high-end restaurant helmed by Chef Gunther Hubrechsen at Purvis Street during Singapore Restaurant Week back in March. If I have to summarize the dining experience in one word, that word would be 'Awesome'! Singapore Restaurant Week is a biannual event where participating restaurants will present an exclusive set menu for lunch and dinner priced at $25++ and $35++ respectively (DiningCity star-awarded restaurants charge a supplement of $15 for lunch and $20 for dinner). Though it's a great chance to try the food at some fine dining establishments without breaking the wallets, I did not make any reservations during the restaurant week that time round, as my usual makankaki (my BFF) was on reservist then. But it was a temptation too great for me to resist when photos of delicious food from Gunther's started appearing on my instagram feed. So, together with a few blogger friends, we quickly made plans and booked our seats at Gunther's for lunch. The photo dish which had us all tempted was that of the Cold Angel Hair Pasta. Served on a chilled plate with fresh tomato, soft mozzarella and finely-shaved ham, it was a simpler rendition of Gunther's signature cold angel hair dish with Oscietra caviar. The cold pasta was springy to bite, each mouthful was refreshing and full of delicate flavours copulating in perfect harmony. It was downright excellent and had us moaning in pleasure for more. After having this, I'm definitely acceptable to paying a premium price to try their signature dish with caviar next time. The other starter offered on the set menu was the Carpaccio Wagyu Beef, Tartare style. To have the Pan-roasted Foie Gras for a mere additonal S$15++ is another temptation which we succumbed to most willingly. A cut into the goose liver's lightly-crisp brown crust revealed a pinkish luscious looking interior which proved itself to be so melt-in-the-mouth satisfying! The lobe of decadent delicacy was divinely rich and creamy! Bits of crushed almonds gave it a beautiful textural contrast and enhanced the delicate flavour of the foie gras with a touch of nuttiness. Major love! Some of us, including me, chose the Grilled Brittany Cod Fish for the main course. Beautifully grilled with snowy white flesh that was fresh and succulent, it paired delightfully with the mushroom sauce and couscous of vegetables. The fish was delectable but I can't help but felt a tinge of jealousy when I saw the giant slab of Pork Ribs served with tomato rice! My fish suddenly turned midget in size lol. I was blessed to be given a chance to try a small portion from my dining companion's plate and gosh, it was superbly fantastic! Done Provencales style, the meat was deliciously tender with soft melting fats which I happily indulged in. Ooh I love to eat fats, just that I don't like them appearing on my body. Full of flavors with no trace of porky smell at all, the pork ribs was one that put me in state of regrets for not choosing it. Of course I did not bemoan over my regret for long, because....... desserts is served! There was no options available and we all had the English breakfast Tea Bavarois, a creamed custard lightly infused with fragrance of tea. Paired with a light lemongrass sauce and finished off with a drizzle of salty caramel, it was enjoyable. Together with the Petit Fours of thin crispy almond cracker, buttery madeleine and dark chocolate praline, it was a blissful end to the meal. The dining experience at Gunther's was indeed an awesome one. Not only was the food impeccable, the service was attentive and faultless, leaving us all deeply impressed. Gunther's reputation as a top dining establishment is one which it certainly lives up to and absolutely deserves the many accolades it was awarded.